In 1940, Gomez suffered an arm injury, which left him up for grabs by another team, but in 1941 he played fairly well, winning 15 and losing 5. 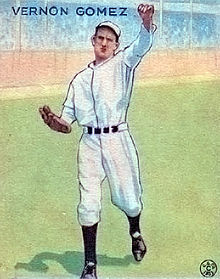 During that season, he was said to be a great starting pitcher, but won through the support of Johnny Murphy, who relieved him in later innings. After the 1942 season ended, Gomez took a job as a dispatcher with the General Electric River Works, a defense plant in Lynn, Massachusetts, which only paid $40 a week. Then on January 27, 1943, the Yankees sold him to the Boston Braves for $10,000 ($144,788 in current dollar terms). 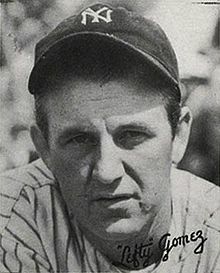 Gomez never appeared in a game with the Braves, as later in the year he was released from his contract and signed with the Washington Senators. He pitched just one game ― on May 30, 1943, allowing four hits, four runs and walking five men ― before pulling a shoulder muscle in the fifth inning and retiring from baseball. He had a 189–102 career record with 1,468 strikeouts and a 3.34 ERA in 2,503 innings pitched. ^ a b Gomez, Vernona; Goldstone, Lawrence (2012). Lefty: An American Odyssey. New York: Ballantine. ISBN 9780345526489. ^ "Lloyd J. Gomez Obituary". Oakland Tribune. Oakland, California. January 20, 1960. p. 29. ^ a b Fraley, Oscar (January 27, 1943). "Yanks Sell Lefty Gomez to Bees; Price is $10,000". The Modesto Bee. Modesto, California. p. 8. ^ a b "Lefty Gomez Quotes". Baseball Almanac. Retrieved August 5, 2013. ^ "Lefty Gomez". Baseball-Reference.com. Retrieved January 23, 2013. ^ "Oct 6, 1937, Giants at Yankees Play by Play and Box Score". baseball-reference.com. ^ "Gomez wife to fight divorce suit". The Lowell Sun. Lowell, Massachusetts. December 27, 1937. ^ "California Death Records". Ancestry.com; Search under "Eilean Frances Gomez"
^ "To Fight Divorce". The Lowell Sun (301). Lowell, Massachusetts. December 28, 1938. ^ "Gomez Would Speed Divorce Plans". The Lowell Sun. Lowell, Massachusetts. January 3, 1938. p. 10. ^ "Lefty and Wife Call Off Suit". Nevada State Journal. LXVII (182). Reno, Nevada. May 9, 1928. ^ a b Durso, Joseph (February 18, 1989). "Vernon (Lefty) Gomez, 80, Dies; Starred as a Pitcher for the Yankees". New York Times. ^ "Baseball's 100 Greatest Players". Baseball-Almanac.com. Gomez, Vernona; Goldstone, Lawrence (2012). Lefty: An American Odyssey. New York: Ballantine. ISBN 9780345526489. Rogers III, C. Paul. "Lefty Gomez". SABR. This page was last edited on 27 January 2019, at 21:50 (UTC).